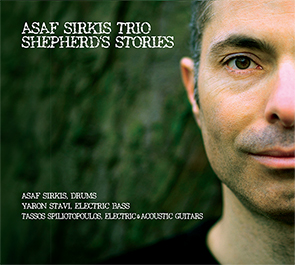 ‘Fusion that harkens back to a time before the genre became codified, diluted and reduced to a critical joke’ is how celebrated jazz commentator Bill Milkowski categorises the music produced by drummer/composer Asaf Sirkis’s trio – completed on this, their third album as a unit, by electric bassist Yaron Stavi and guitarist Tassos Spiliotopoulos – and Shepherd’s Stories more than justifies his assertion. Although understandably lionised as a hard-driving, tumultuously energetic drummer, Sirkis is also capable of playing with considerable delicacy, attentive to the subtlest rhythmic nuance, and on each of the eight compositions that make up this rich and absorbing album he precisely calibrates his drumming, from the thunderous, tumbling vigour that fuels the music’s many climaxes to the quietest embellishments of its more tender, lilting moments, to suit the impressive variety of moods it embodies. His trio is capable of moving, almost imperceptibly, from the gentlest spaciness to roiling rumbustiousness, and all three members – the sonorous Stavi, the spikily fluent Spiliotopoulos and the leader himself – produce intense, cogent solos that arise easily and naturally from the affecting, deceptively simple melodies whose apparent familiarity gives the album its name. With guests Sywia Bialas (vocals), Gareth Lockrane (flute) and John Turville (Fender Rhodes) all adding their distinctive voices to the occasional track, Shepherd’s Stories does indeed, as Sirkis suggests, have a ‘greater sense of deliberation … a more effortless, natural and improvisatory approach’ than his previous albums, classy as they undoubtedly are.